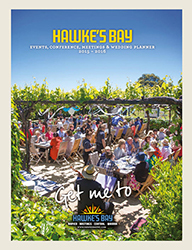 The Hawke’s Bay Conference and Incentive Guide is produced every two years by Hawke’s Bay Tourism. It is designed to include all the information and referrals Conference and Incentive planners need to help start planning their conference, meeting or incentive in Hawke’s Bay. Last updated in 2017 the next chance to add your listing to this planner will be in 2018/19. Please contact Kerryn Ralston to express interest in advertising in the 2019 Conference and Incentive Planner.